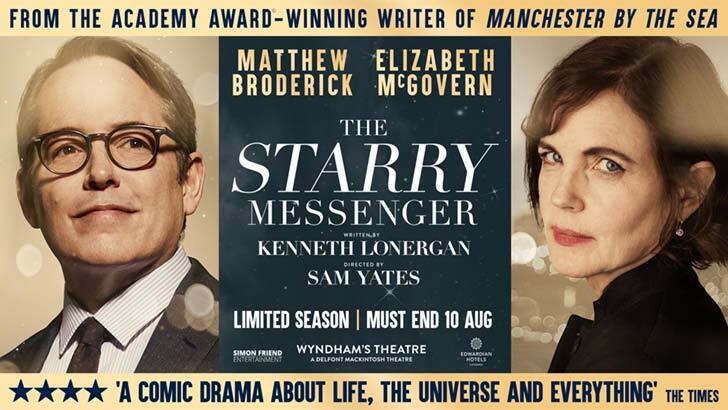 Starring Matthew Broderick (Ferris Bueller's Day Off, Mel Brooks' The Producers), and Elizabeth McGovern (Downton Abbey, The Handmaid's Tale), this bittersweet, comic drama is an unblinking exploration of love, hope and understanding our place in the universe, by one of the most celebrated writers working today. The running time of THE STARRY MESSENGER is to be confirmed. For evening performances a theatre bar will be open from 6.00pm and the auditorium will open at 7.00pm. For matinee performances a bar will open at 1.30pm and the auditorium will open at 2.15pm. Preview pricing available until Monday 27th May 2019. Band A reduced to £45.00, valid Tuesday & Wednesday evenings and Wednesday & Thursday matinees. Subject to availability. To add some extra sparkle to your evening, why not upgrade your The Starry Messenger booking to one of our Champagne or VIP Packages? Preview prices start from £127.50 (£137.50 from 28th May 2019) per person, inclusive of VAT. Preview prices start from £182.50 (£192.50 from 28th May 2019) per person, inclusive of VAT.